Motor vehicle in pristine condition! My Dad had one of these - saloon model in black with running boards! All 4 of the family squeezed in and with suitcases!! Lovely thing. Strange I didn't know this was on. Shows like this don't seem to get all that well publicised for some reason. I doubt many could afford one of those back in the 40s & 50s, most working class couldn't afford a car at all unless you were a doctor or in a professional well paid job. Love classic/vintage cars, so much character and charm, but sadly these days they are well out of reach for most of the average person due to sky rocketing values. I wonder if the owner ever uses it as it should rather than it being stuffed in a garage throughout the year under some carcoon or heated garage like so many are. People with classics seem to have a thing about going overseas to France and Italy on a tour; what's wrong in driving the car in this country?. Now Johnny,I bet you were drinking out of cups then..what happened to your Dads car. 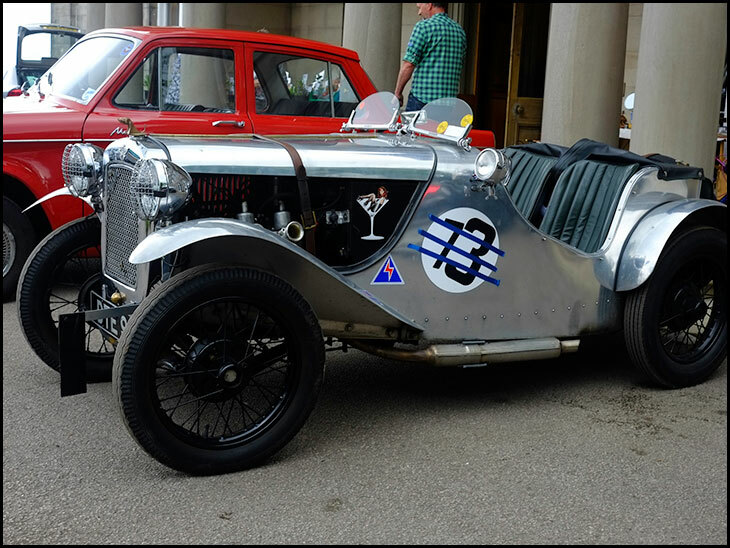 Ab, the owner of this car uses it to compete in hillclimbs so it is used as it should be, hence the "racing numbers". I fully agree with your comments, though, about many being stuffed away as an asset rather than being enjoyed. My first car was a 1933 MG J2, how I wish I still had that!!! He didnt keep cars for long..I think he traded it in for a Hillman California, another small car. Friends would say the ash-tray's full, time Dad changed his car! Other cars he had were Singer Gazelle, Morris Minor, Ford Capri and Ford Zodiac..
Southport and Formby were us regular trips out! Bought meself a tin mug outta Tescos. Ab the next Vintage Fair at the Hall is 17th July. You get a few old vehicles but it isn't a car show/rally as such.Worth a look though...only £1 to go in. My first car was a Ford Anglia, we had a posh 1200cc Super, weekend trips out were a regular occurrence, best trip for me was out of Macclesfield, up to the Cat and Fiddle pub for lunch and down to Buxton, beautiful ride. Ive never seen the appeal with hillclimbs, rallies, track days, or any other kind of racing for these classics, I just think these cars should be used on the roads and not mingling with the rich club at Millie Miglia, Goodwood Revival or wherever. I find motorsports boring to be honest; sticking racing stickers and stripes over a beautiful car just spoils the look of it. Been to a few meets at the Corner House in Wrightington lately, good turnout of vintage and classics: E Types, Xk120, Austin Healey, Morgans, etc (some very valued ones too such as a Ferrari Daytona, which I think fetch around half a million), however, so many look like they never get used much.